The Good. It’s much brighter here today, even a little bit of sun and blue sky. Having said a few posts back that I don’t cut the flowers that we grow on the plot I brought these home today. The heavy rain has caused several of the stems to topple over into the alchemilla molis. 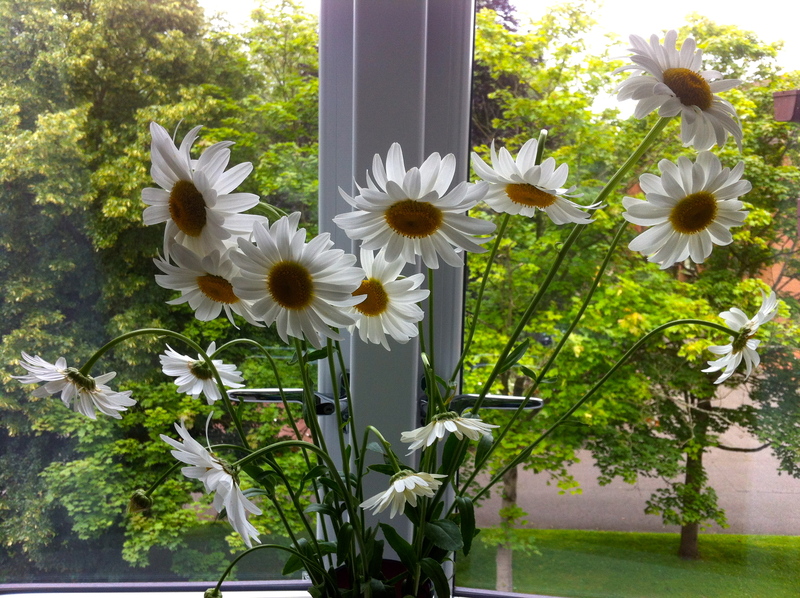 So here they are on the windowsill. The Bad. Having read this post by David Ford yesterday I though I would have a rootle round in one of the potato sacks to see what was happing. They do look very nice and I’m guessing they will have all the nutty, fresh flavour that is characteristic of Pink Fir Apple but they are small and there’s not many of them. The Ugly. A while ago I lived on a farm it served mainly to make me realise that I am a dyed in the wool city dweller, not very good at dealing with natures’ sometime brutalities. Of course now I live in Middlesex I don’t have to. This morning however I came face to face with a dismembered bird, foxes I am assuming, and a swarm of flies. I am very grateful that Dai was around to clear it all up. 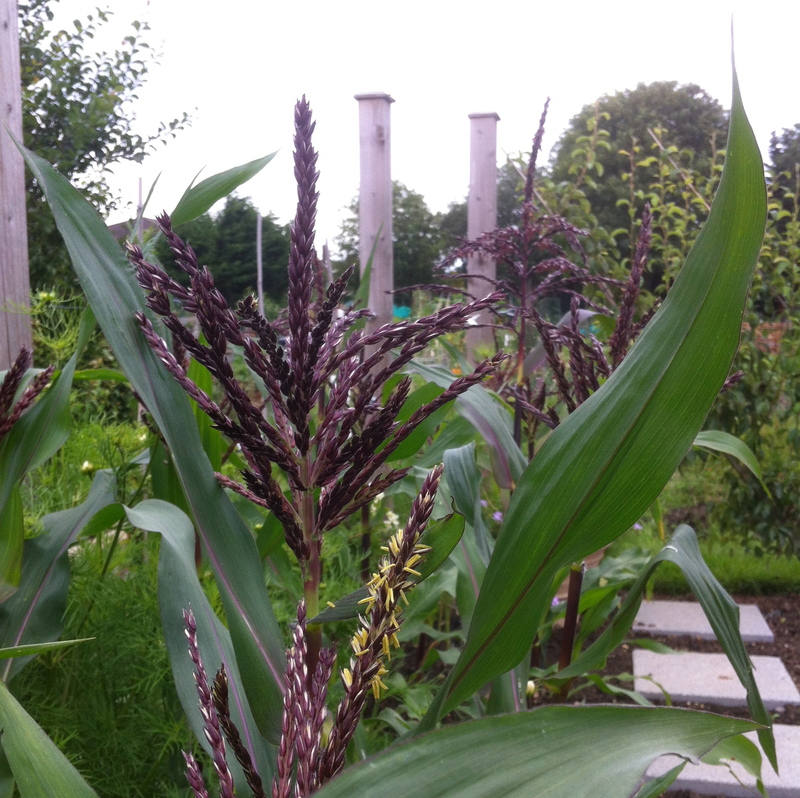 Suffice to say I didn’t take a photograph, hence the picture of the sweet corn tassels. So that was my morning, let me know in the comments what you’ve been up to. I’ve not been able to get to the plot today but hopefully will tomorrow. The only flowers that I generally bring home, apart from sweet peas, are ones that have ‘gone over’. 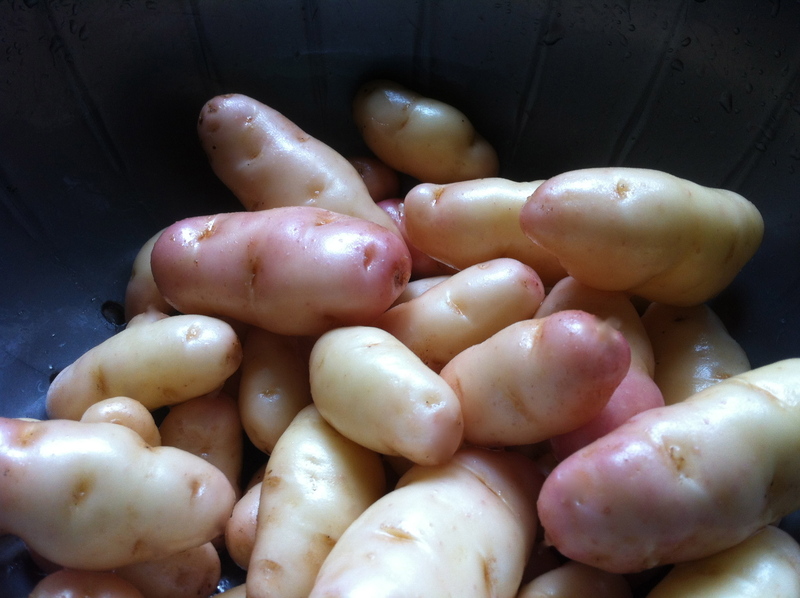 I shall be digging more of my potatoes up this week. We’ve been luck with the dead animals thing. Just two birds and a hedgehog in three years but still can’t bear it. Thank you David. I love Pink Fir Apple. I think we have some Anya as well but going to leave the rest for another couple of weeks.